WMCAT teen artists install mural for House of Style, dedication on November 3 at 4 p.m.
A public dedication of the new House of Style mural will take place on Thursday, November 3 at 4 p.m. in the parking lot behind House of Style, 2013 Division Ave. South. The public is invited to celebrate the mural and meet our teen artists. Through Neighborhood Ventures, House of Style was connected with the West Michigan Center for Arts + Technology and our innovative teen arts program. Three advanced illustration teen students, under the guidance of Professional Teaching artist and local muralist George Eberhardt, created and installed an original mural on two panels at the rear entrance of the store adjacent to a popular public parking lot. WMCAT Teen Artists Daniel Cornejo, a senior at Union High School, Railyn Eaddy, a sophomore at Grand Rapids Montessori, and John Newton, a junior at Ottawa Hills, began their design process by interviewing Debra. 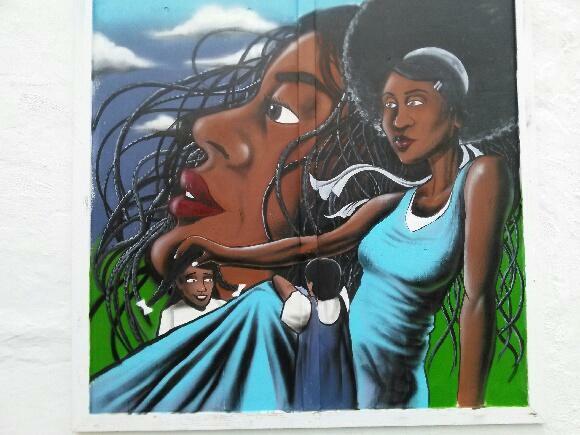 She told them it was important that the mural include a woman with natural hair and children to represent the future. The three teens drew several individual sketches, then combined their ideas into a final drawing. Railyn’s ideas and sketches served as the predominant theme and idea. The new House of Style mural is up for a Neighborhood Business Award for Best District Project or Promotion from the Neighborhood Business Alliance. WMCAT’s Teen Arts + Tech Program engages Grand Rapids Public high school students in an after-school experience in arts and technology. Teens learn, create and grow in studios including illustration, photography, ceramics, video game design, fashion, video production, and audio production. The program has been nationally-recognized as a top creative youth development model by the President’s Committee on the Arts and the Humanities for three consecutive years.